The state of the economy is always a concern with any company in any line of business. With the American manufacturing industry experiencing growth in the past couple of years, there have also been some shaky areas in its foundation. While there is growth, there is still a significant skills gap to fill. There are also still concerns about reshoring jobs AKA bringing manufacturing jobs back to America. Growth in the manufacturing industry can be a double-edged sword. 1 – Volunteer for organizations helping with the skills gap. There is always extra work that needs to be done for non-profits. Even if you don’t have manufacturing-specific technical skills, or if you have peers who do not work in this field who want to help, any number of skills are needed to fulfill different tasks. A good example is Workshops for Warriors, who always needs volunteers with Marketing experience and for specific office work to be done. You may even be able to volunteer for some of these organizations remotely if you do not live in the area. 2 – Donate to schools or programs teaching STEM or manufacturing-specific courses. Students interested in STEM (Science, Technology, Engineering, and Mathematics) are sometimes lucky enough to find programs provided by their schools, such as Cardinal Manufacturing at Eleva-Strum School District. Otherwise, some kids may need to partake in these activities outside of school with places like Open Source Maker Labs (OSML). This fabrication lab is always seeking donated equipment to help their students create more. Another source of assistance would be to contact local Community Colleges who have manufacturing-related courses. See if they need any materials for the students of those programs – they could need anything from welding masks to extra pads of paper. 3 – Contact politicians. It can be easy to forget that the people who run this country work for us. We can remind politicians that the best ways to enrich our industry are to increase competition against global manufacturing by fixing our taxes/regulations, as well as building a national strategy to help our infrastructure, and increasing R&D (research and development) tax credits or funding possibilities. Even creating more grants, scholarships, and national skills certification programs in the areas of STEM would help our industry greatly. There are many other areas in which the government has a level of influence to help. On a lower level, you can speak to your city council about locally making more manufacturing opportunities available. You can even try to contact your State Representative(s) or the Governor of your state. The highest levels of influence for manufacturing in politics would be through Cabinet officials in the Departments of Energy, Commerce, Transportation, Defense, Labor, and Education. Agencies that affect our industry are NIST, ARPA-E, NSF, OSTP, SBA, DARPA, AMNPO, the Economic Development Administration, and the US Commercial Service. 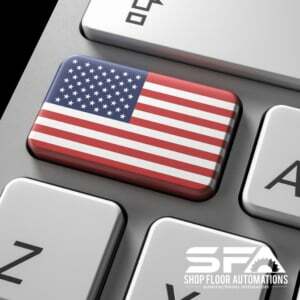 If you are looking to help your shop floor be more productive before you can help on a larger level, please contact us. We can help with OEE, productivity issues, and help you stop wasting money on downtime. Call (877) 611-5825 or fill out a contact form here.